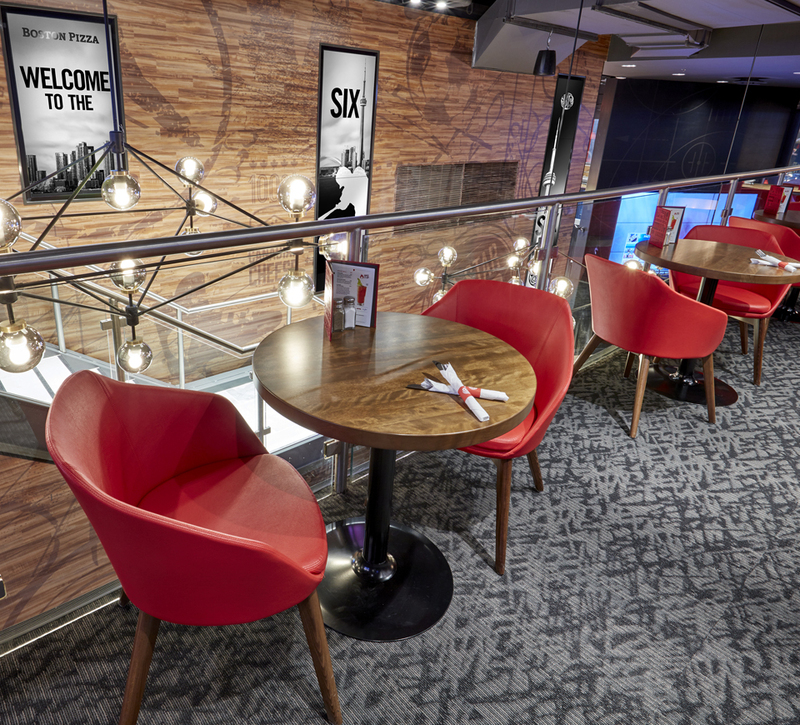 Shikatani Lacroix was commissioned to design an immersive restaurant bar experience that effectively executed a “two concepts under one roof” strategy. 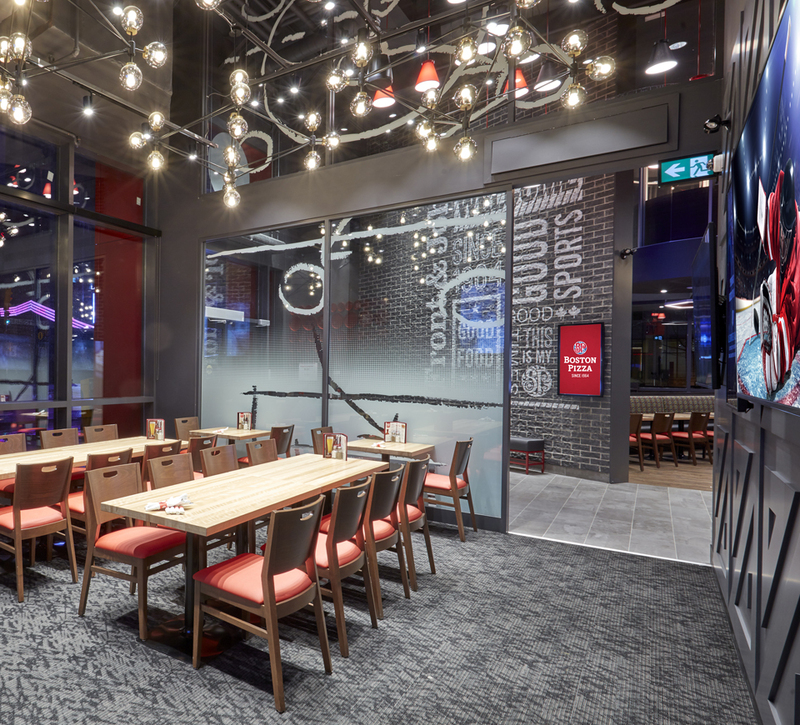 Shikatani Lacroix partnered with Boston Pizza to develop a new restaurant design standard for North America that would reinvent the restaurant brand to stay competitive in the marketplace. 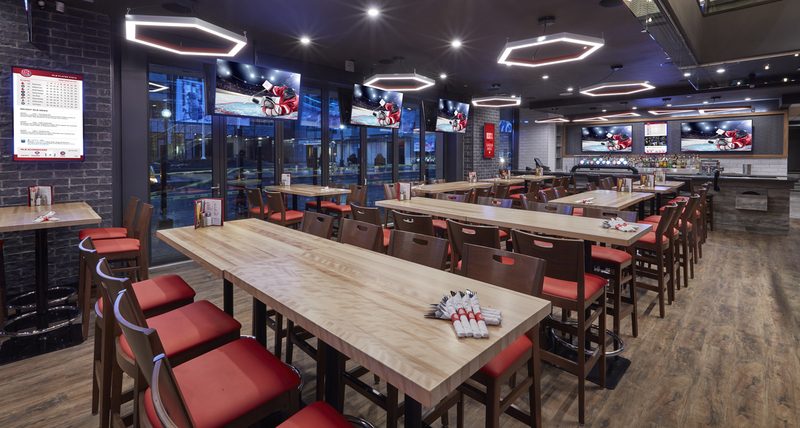 Boston Pizza felt it was time to elevate and contemporize its design and reaffirm its position as the ultimate sports entertainment restaurant destination to compete against other higher-end fast casual chains that are offering alternate experiences. 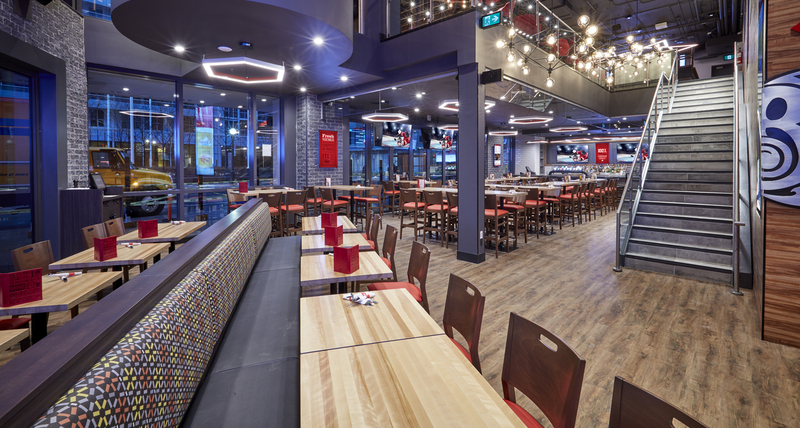 Boston Pizza wanted a synergetic design that would maintain its brand equity in all markets, but would be flexible enough to adjust to varying market conditions as required. 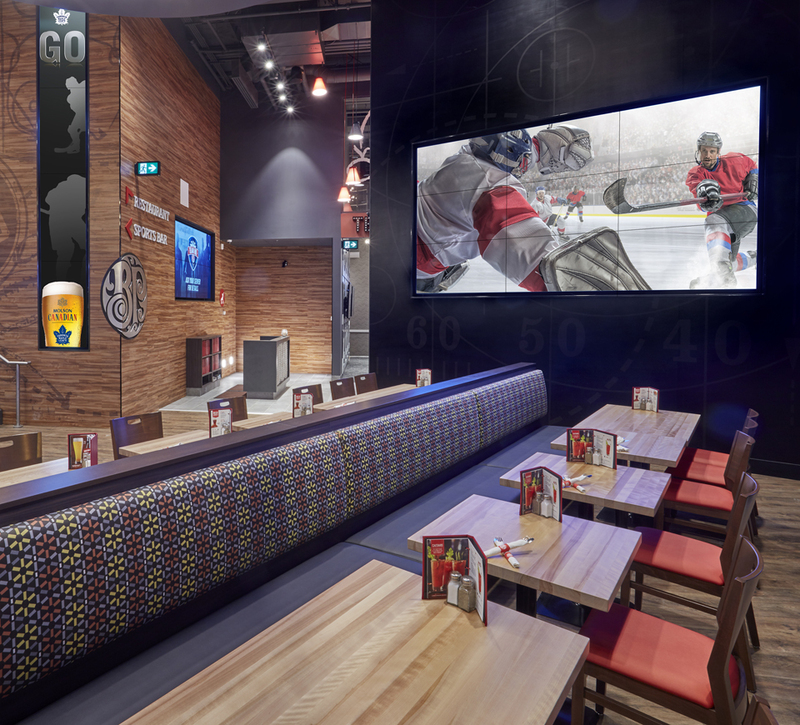 The new restaurant design also had to consider various external brand elements – such as the tradeshow program for Boston Pizza’s annual franchisee conference, its staff uniform design, and a digital experience strategy for all restaurant devices. 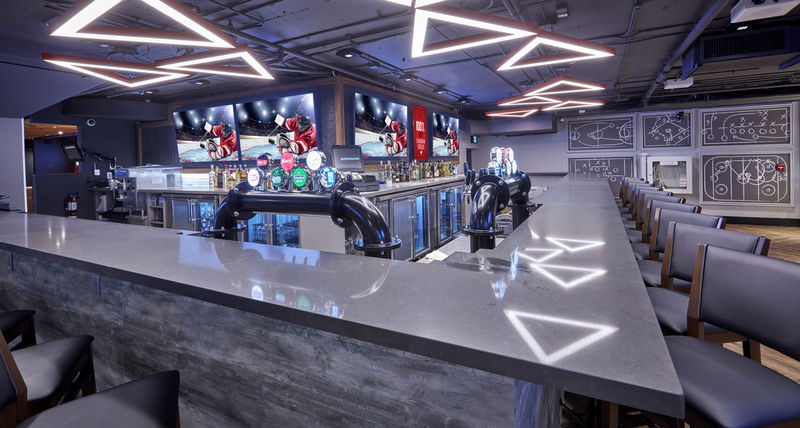 The brand-new flagship location at Front and John streets in Toronto’s downtown core is located near the city’s two major sports stadiums: Rogers Centre and the Air Canada Centre. 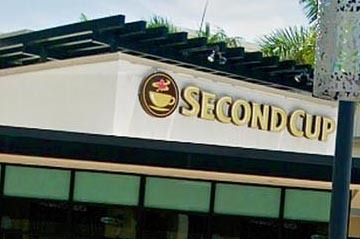 With a fixed budget and aggressive timeline, Shikatani Lacroix had many factors to take into consideration when designing the new flagship location. 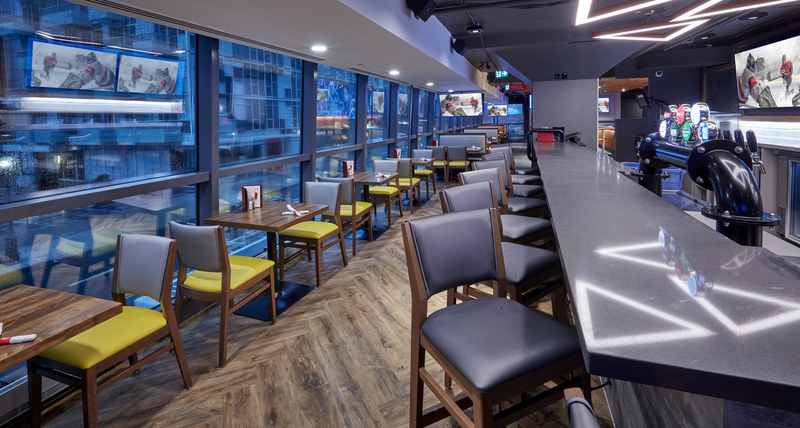 The overall restaurant design required a flexible program that was adaptable and scalable, ensuring kitchen functionality was not compromised. 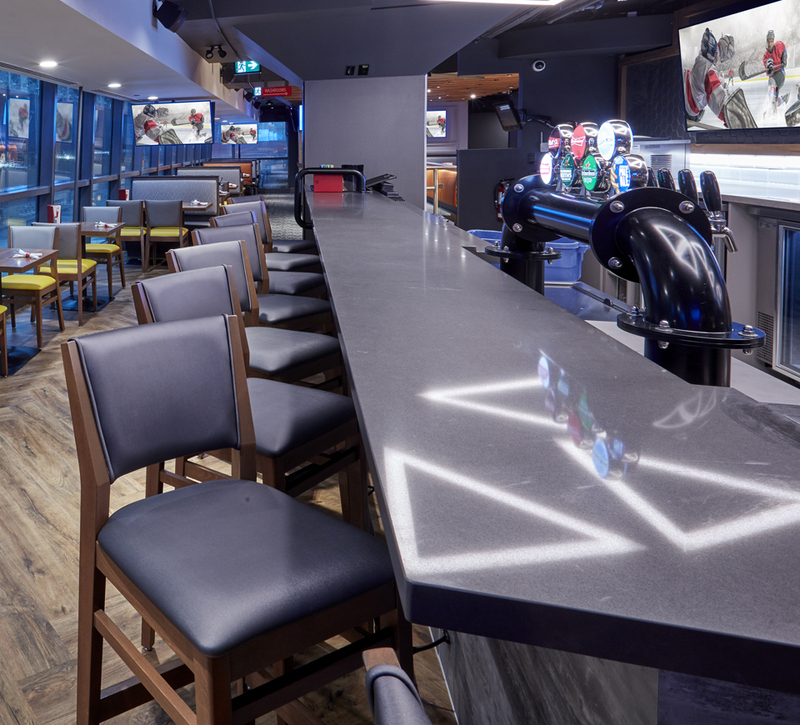 The main entrance and hostess area needed to be welcoming and allow customers to quickly decide which area they’d like to be seated: restaurant or bar. The modular design had to balance family and sport and improve satisfaction for all customers, without compromising the design aesthetic and traffic flow. 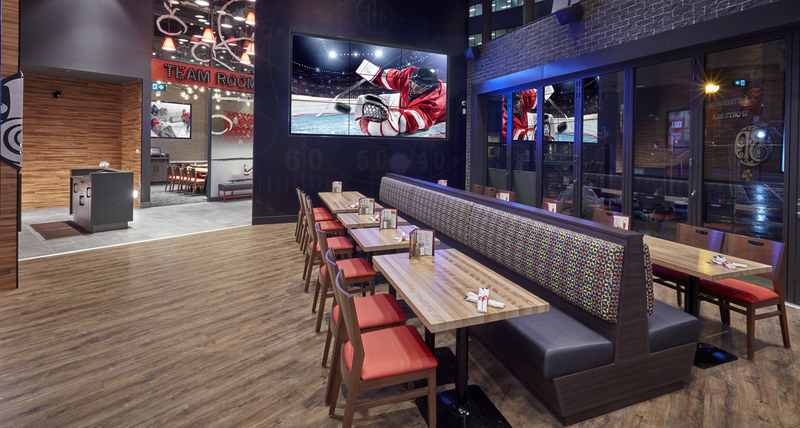 Shikatani Lacroix also needed to establish the role of take-out/delivery by strengthening the interior integration while establishing a more prominent exterior presence without disrupting the overall look and feel of the space. Following our ThinkBlink process, we identified areas of opportunity to create more immersive customer experiences that effectively deliver two cohesive concepts in one location. Shikatani Lacroix conducted research in Canada, Mexico and the United States that included more than 30 stakeholder interviews, store tours and competitive audits (in Toronto, Niagara Falls, Edmonton, Dallas and Mexico markets), and a best in class audit (in all currencies). Our firm also conducted a trend report to determine areas of opportunity that could be leveraged as part of the design exploration process. 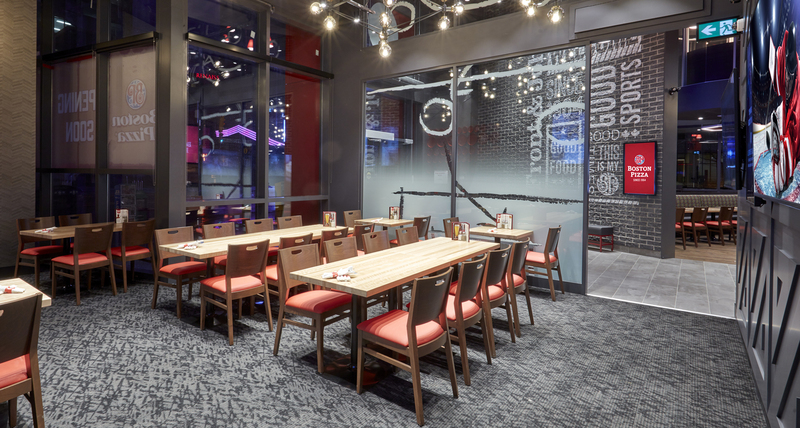 The competitive landscape in sports and casual family dining has been elevated through décor, technology and design. 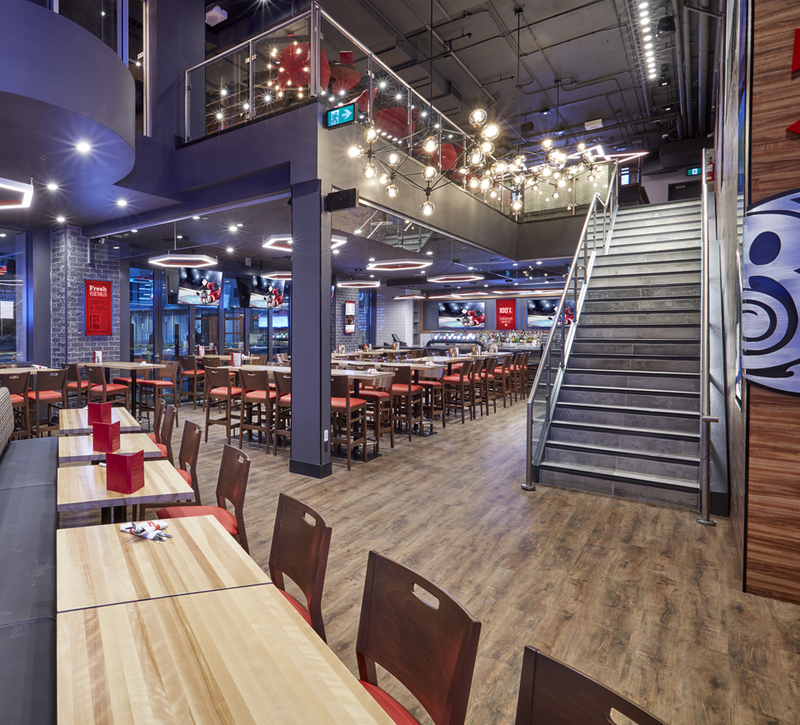 To effectively compete with these evolving specialty chains, Boston Pizza needed to improve its game by leveraging what made it unique: a family dining and sports bar experience under one roof. Unique designs had to provide a greater distinction and separation between these two experiences. The concept “being a fan” needed to be an ownable and differentiated experience by strengthening community connections. 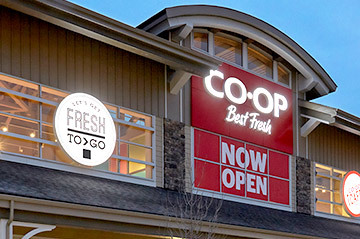 This was accomplished through a clearly defined strategy and brand position, interior design, wayfinding, and digital signage. The design stage explored different floor plans, layouts, exterior and interior signing, and décor for a tiered investment model. 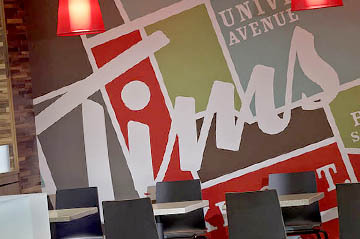 This unique, urban, Boston Pizza location is situated in a competitive and saturated restaurant market where first impressions are very important. 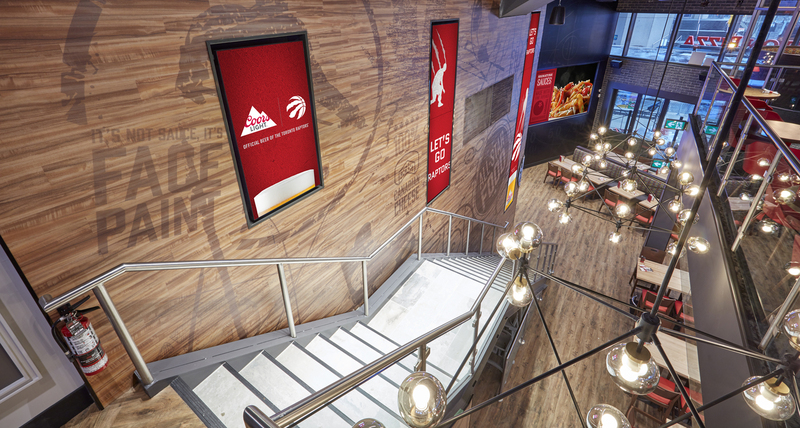 An arch at the entrance, in Boston Pizza red, frames the entry experience and increases brand visibility. 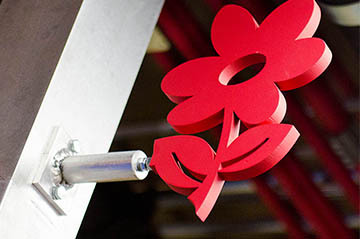 On the exterior wall, the location, Toronto, appears as secondary signage under the BP logo. The exterior has a more contemporary design, with cleaner lines and glazed finishes. 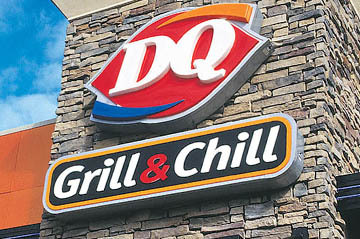 The takeout/delivery signage was also made more prominent on the exterior building. Inside the restaurant, Shikatani Lacroix created a welcoming environment that is both comforting and contemporary. Brick veneer walls, concrete looking porcelain tiles and dark grey metals give an urban and modern feel to the environment. 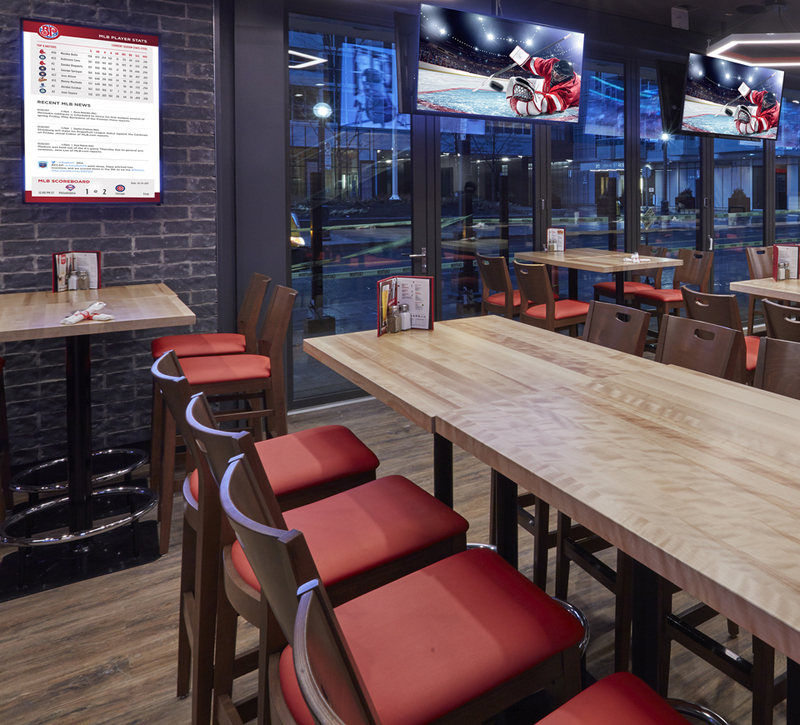 Wayfinding is used to clearly identify restaurant and bar, allowing customers to quickly decide in which area they would like to be seated. Vinyl wood plank walls add warmth, texture and depth to the space. 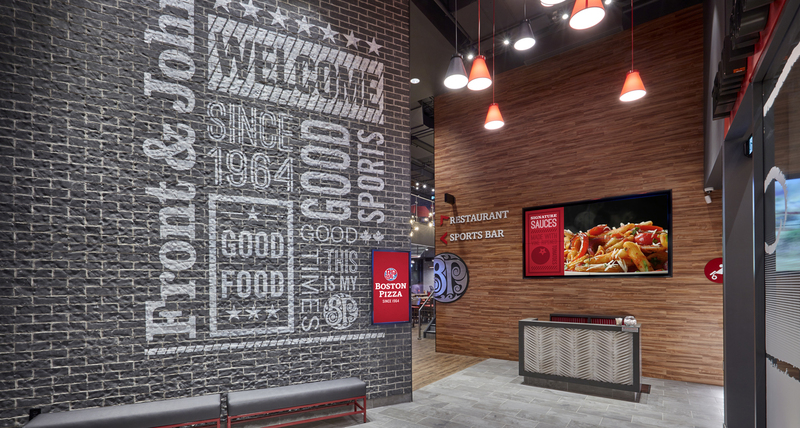 And fun graphics throughout the space create playful moments that pay homage to sports, the city and its citizens, while emphasizing the Boston Pizza brand. The restaurant seating is very flexible in design, with modular segments for easy scalability. The seating can accommodate groups of every size. The restaurant has communal tables, with varied seating types allowing for clear zone segmentation. Every seat in the house has a view of a digital screen. 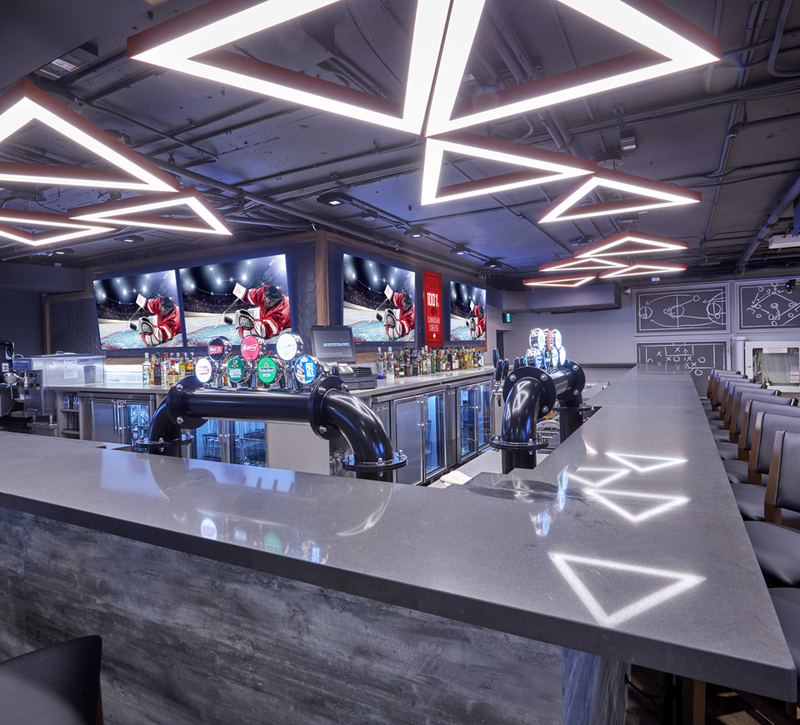 The new restaurant concept also includes a designated Team Room that can accommodate private parties and sports teams or can function as an extension of the main restaurant. 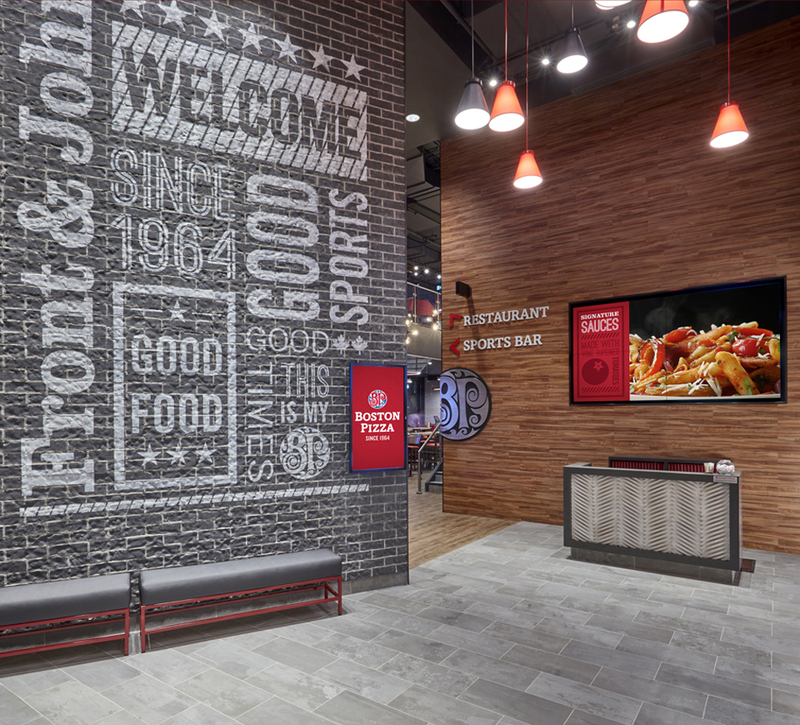 Its decorated with a pizza pan wall, which also serves a practical purpose for patrons to visualize the physical size of the pizzas on the menu. In the bar area, bi-fold sliding doors open to the patio in warmer seasons, allowing the interior space to spill out onto the patio and be visible from street level. 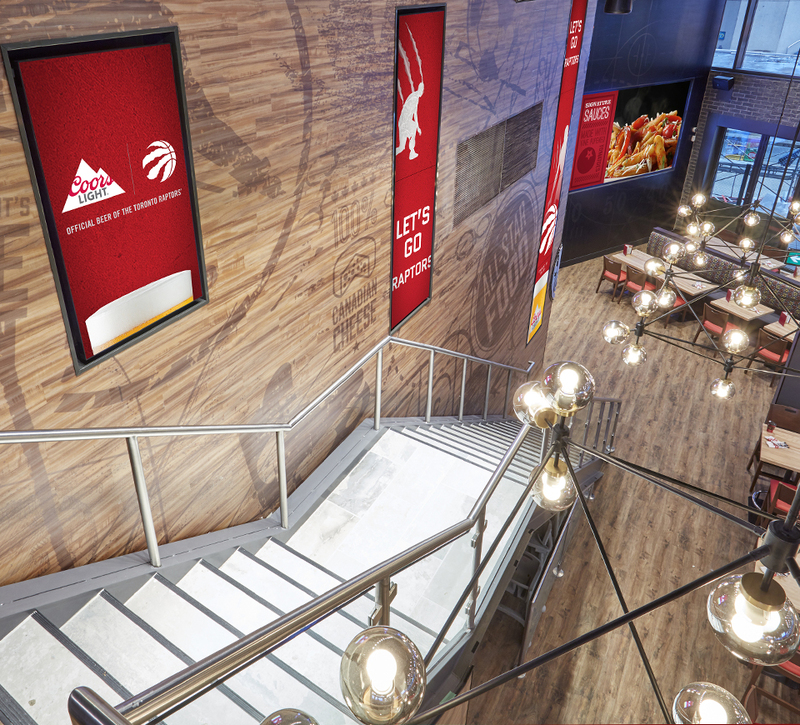 To enhance the customer experience and provide better communication, digital screens were used throughout the restaurant. 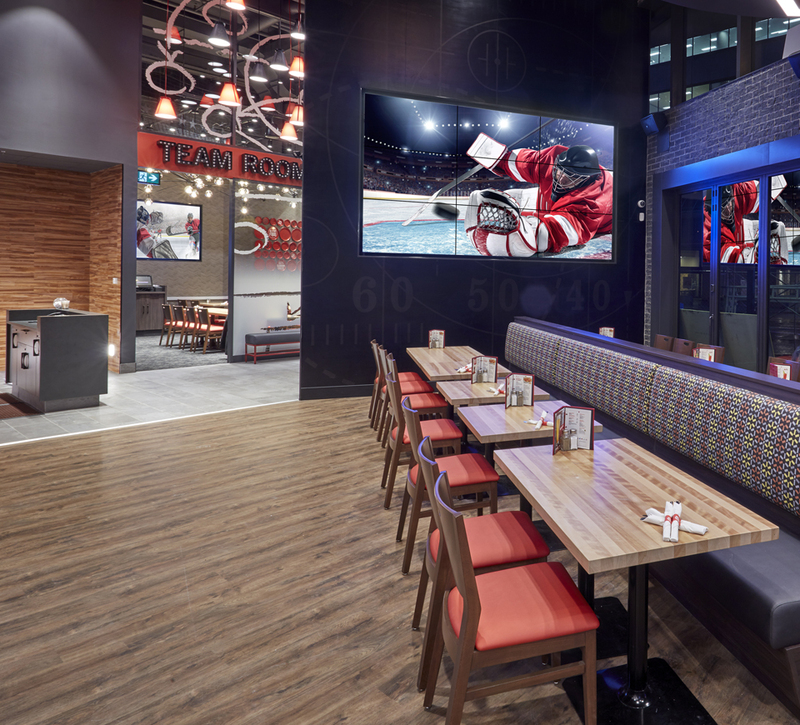 The welcome area has a large digital screen behind the hostess section which communicates brand messaging and welcomes BP rewards members, special event groups and teams visiting the restaurant. 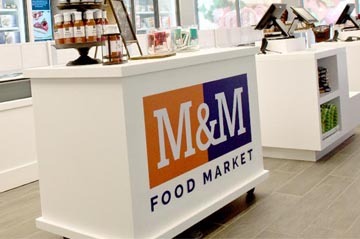 An interactive touch screen in the waiting area includes brand messaging, feature dishes and special events content, and allows customers to interact with a digital menu. 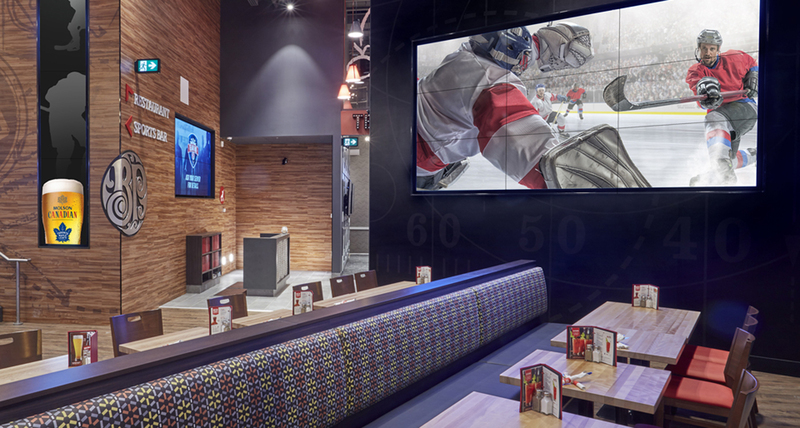 Boston Pizza looked to position the digital screens as a one-stop shop for their consumers’ sports needs while dining. 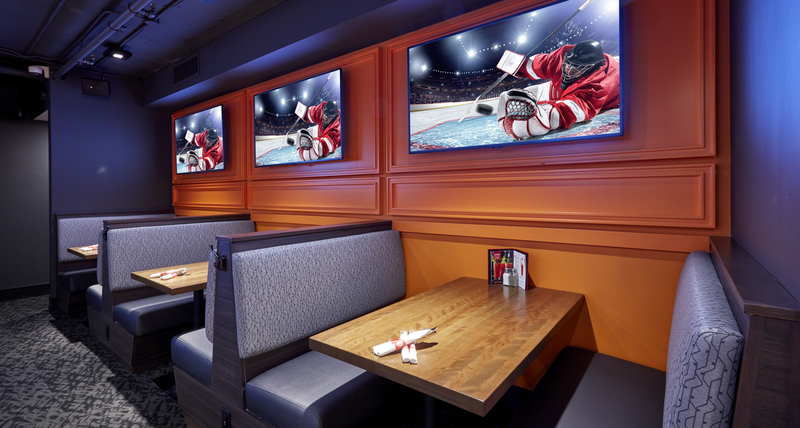 Throughout the restaurant are large screens where customers can watch all major sports. To enhance the experience, smaller portrait screens provide dynamic, RSS-driven, digital messaging with team statistics, player statistics, news, game schedules, team match ups, player match ups, and valuable information for fantasy leagues for all major sports: NBA, NHL, MLS, MLB, NFL. The content pulls from varying news sources and automatically updates in real-time. 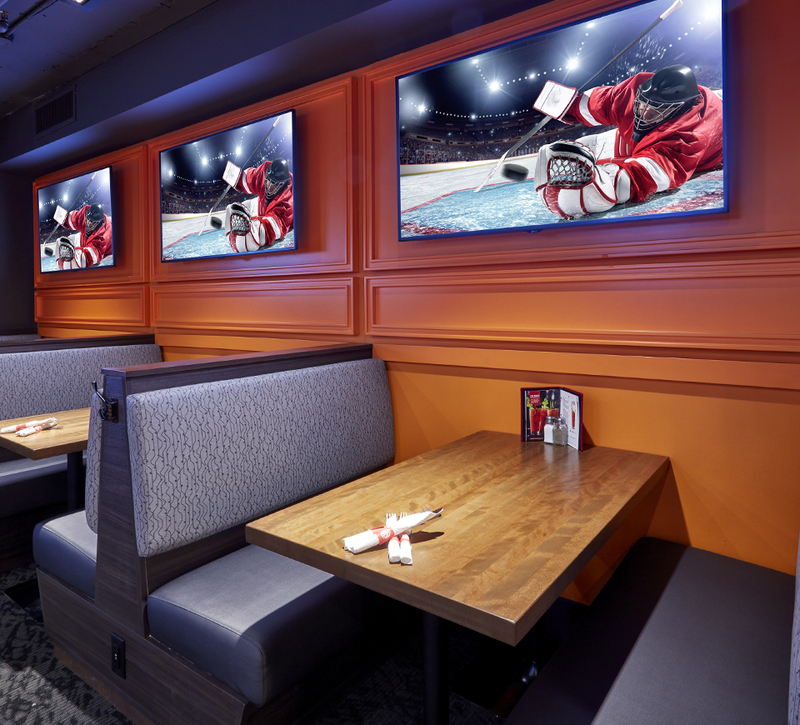 The space also includes multiple digital feature walls with digital content presented in an engaging Boston Pizza canvas, positioning Boston Pizza as the ultimate provider of sports content and information. 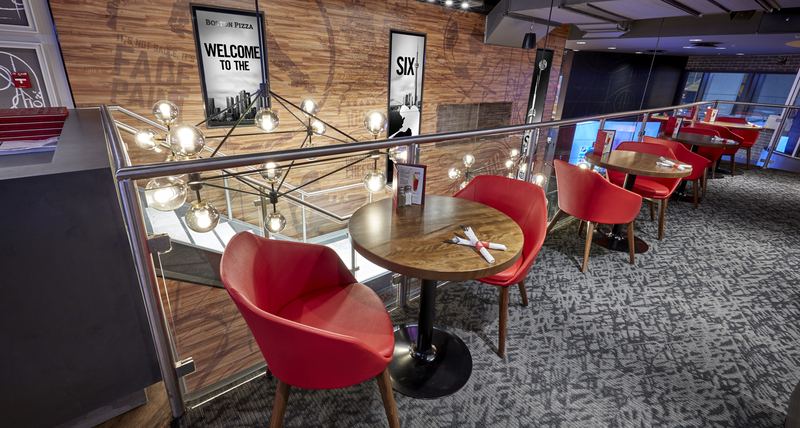 The collaborative design process resulted in an immersive restaurant bar experience that is playful, open and urban, with digital elements integrated throughout the customer path. It better connects patrons throughout the space and with the city at large, while helping fans celebrate their team, their city and themselves. 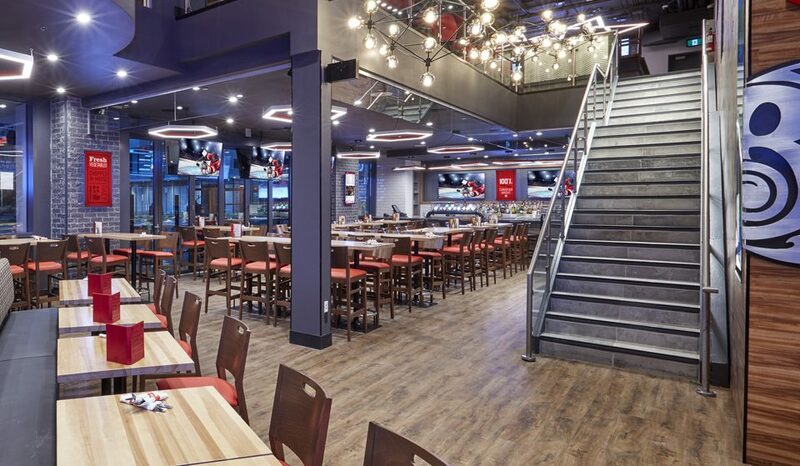 With this new design concept, Boston Pizza reinforces its reputation as the ultimate sports entertainment restaurant destination.